Simon Diffey, the brains behind ‘Gold Member’, acquired the restored rolling shell from BMW specialist BM Technika. 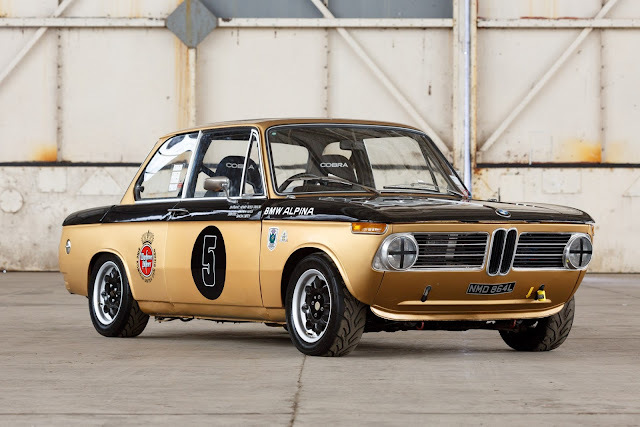 Diffey wanted to build a 2002 to European Group One ‘all steel, all glass’ specification for himself and his son to race, creating a homage to the privateer BMW racers of the early 1970s. From bare metal, the shell was painted in a Warstiener livery that would have slotted into the grid at Spa in 1972. The engine came from Snitzer, with a reconditioned Lester Owen head from Historic BMW specialist Laranca. Mass Racing originally built the engine, and after a few seasons of racing have just completed a complete refresh. The gear box was rebuilt by JP Rave Boxes Rob Riding. The Limited Slip Diff was a prototype unit built by Phil Quaife and set up by Chris Connoly of Mass (proving so successful that they are now available to buy from Birds BMW). As the project progressed, everything that needed replacing was attended to, and the file is extensive. In 2014 it was invited to compete at the 72nd Goodwood Member Meeting, driven by legend Jochan Mass. It has all the right parts to make it competitive including the 200bhp Mass engine and 5-speed ‘box. It’s eligible for numerous events including the ‘Master 70s Celebration’, the ‘Classic Sports Car Club Super Saloons’ and ‘Legends Historic Touring Car Challenge’. Ready to race and on the button, it is a fabulous little race car, or could provide a very inexpensive entry into the Tour Auto.